There are 11 reviews of Diorama. The modern version of Diorama. I expected some kind of thin,synthetic mess. Most classics are obliterated with regulations, profit margins and unskilled hands of a new perfumer. I am pleased to say I was wrong. The opening is a strong tarty bergamot with the bright yellow ylang. Jasmine follows up and asserts the floral identity. It was bright and of substance, and made this hardened vintage lover reminisce of other fragrances in the past that had similar openings. Truly a rare occurrence in these times. I had a moment where I thought I may have wondered into Niche territory. The familiar jasmine and rose begin to take over with a caraway note as an undercurrent. Plum and peach add the fruity echo from its past and adds body and dimension to the composition. This leans more floral than fruity floral. Please note as some of you reading this that its connection to Femme comes to mind..but its not full of cumin. The caraway hints at its past, but does not send it down that animalistic Femme path. Patchouli & cedar anchor modern Dioramas base. Modern regulations take its toll on Diorama here in the base as well as a lack of the famous prunol additive from the vintage. No oakmoss or animalics to weigh it down. It can be a good thing as these types are seen as outdated or out of vogue. The cost is longevity. Its a well tailored fragrance and Im off to get a bottle for the days I want a vintage feel but not its weight. In its class there is Femme, and Parfum de Therese. I feel this is a great middle option at its price point and design. It is interesting to note that Demachy studied under Roudnitska, so Demachy is a good candidate to keep Dioramas spirit intact. Works in Fall and spring. A little light for winter. Opens as a fresh green/white chypre with a noticeable lily of the valley note. Pretty sure there is some jasmine involved too. It’s quite mellow. Watery isn’t the best descriptor but this has a fresh watery quality to it. Light on its feet. I have to say, the decant I'm smelling has survived remarkably well, being almost 40 years old. It doesn’t smell old at all, quality nor composition wise. There is a clear bouquet of fruit that starts to come out but is never sugary, heavy, or cloying – brings to mind peach and red berries. It’s complimented by the florals and offset by an increasingly prominent green character that strikes me as mildly vegetal, perhaps a small dose of galbanum and/or violet leaf. It's not astringent, though. Maybe 45 minutes in the fruits have receded, the white florals have come forward more, and the jasmine is clear as a bell…but instead of smelling like straight indolic jasmine, it smells like jasmine incense. I get an unlit incense vibe or some kind of resin. It has started to take on an oh-so-slight powdery feel, like super fine talcum powder with oriental underpinnings. It’s so fine that “powdery” seems like the wrong word to use, but I’m at a loss for a better one. 90 minutes in and everything in pretty much status quo, except there is now a leathery component to the base. Given the time period, my bet is on castoreum. Roudnitska is no slouch, that’s for sure. This is an expertly balanced fragrance. Fruit that is never too heavy, jasmine indoles that purr rather than growl, on an airy yet substantial base of powder that isn’t powdery. The good old days, am I right? A friend says, "What's not to like? Diorama is gorgeous." 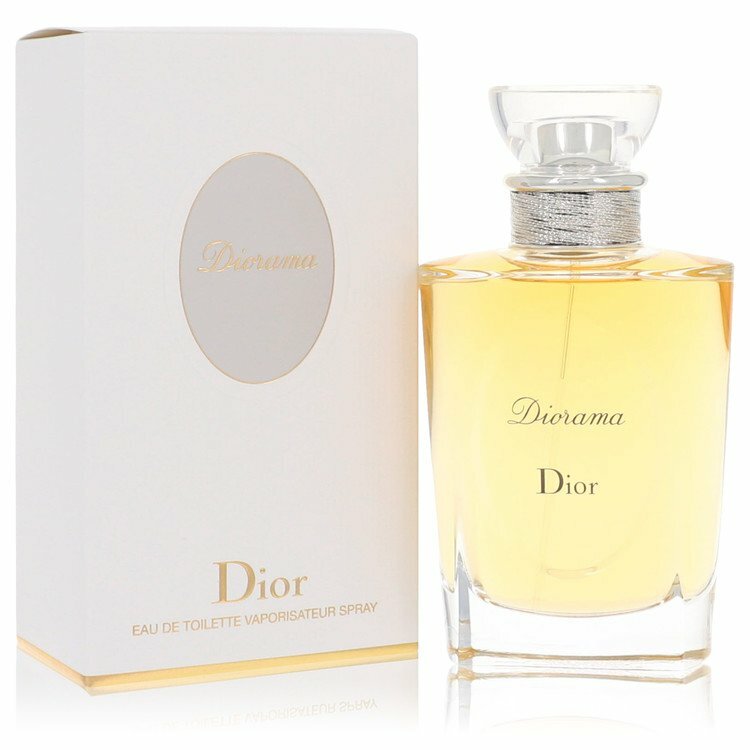 Diorama starts out as a sweet and decidedly indolic white flower fragrance, dominated by jasmine, rose, and tuberose. It has a very satiny, buttery quality about it, a trait that I associate with floral scents of a certain mid-twentieth century vintage. (Patou's Joy is a perfect example.) Because it largely eschews aldehydes, Diorama avoids any "old lady" associations, and leans instead toward the sensuous and seductive side of the white flower spectrum. Compared to something like Fracas or Narcisse Noir, Diorama is a real lightweight! As it develops, Diorama's white flower accord is joined by some oriental spices and subtle green notes, both of which help the scent remain buoyant, despite the heady tendencies of all those indole-soaked blossoms. Diorama mellows and softens with age, revealing a smooth, powdery base as it dries down. What I like most about this scent is a certain balance, so classical in nature, which keeps at bay the overbearing lushness that makes some older white flower fragrances challenging to wear in a contemporary setting. I never had the good fortune to try the original Diorama, but maybe this is really a blessing. Now I can enjoy the new Diorama without having to compare it to a past masterpiece. Having worn and loved the original Diorissimo and Diorella for many years, I felt betrayed by the ghastly shadows that now carries their names. Not so with Diorama (though I must admit I am curious as to what it used to be). New, reissued Diorama is a favourite of mine for all year, all day, any occasion use. It goes straight to a powdery yet distinct floral accord with jasmine, rose, peaches and plum that slowly settles in a lovely mellow woody base. It is a kind of summary of all fragrances I love - it is not one of the most outstanding, but if I had to choose only one for a desert island this would be a contender. Very peachy, very buttery, slightly animalic, very uplifting, very complex, the only Dior creation I actually like, but only in the vintage 1949 version. Barbara Herman calls it fruity, spicy, and powdery, a cross between Mitsouko and Femme, sensual and carnal. Turin calls it a "fruity chypre" but only reviews the re-formulation, which he dismisses as unworthy with only two stars. The vintage is quite fine, one of the best fruity chypres I've encountered, very worth sampling. I just received the 2, 1/4 ounce each bottles of vintage Diorama EDT that I won on Ebay and I can say that every review that I read about it that describes it somewhere between Vintage Rochas Femme, Diorella, Miss Dior and Mitsouko, are pretty much right on target. This, or what I can smell of it, has aspects of all 4 of the scents I've listed. The problem with vintage Diorella in this concentration is that it is very weak sillage-wise and you have to bury your nose in your wrist to smell it ( I've experienced that same problem with Diorissimo EDT, anyone else?). However, what I do smell is absolutely beautiful in it's own special way and even though it has echos of the previously mentioned scents. smelling this leaves me longing to stumble upon a bottle of the vintage pure parfum to get the real Diorama experience. And even though the new re-formulation has received some good reviews, I want to experience it in all of it's real oakmossy goodness, because it's definitely in here. I have to say that even in its weekness, I like it better than all the scents mentioned above, with the exception of Mitsouko, which Diorama is equal too in my book, and could surpass on my top 25 list if I ever get my hands on that bottle of vintage pure parfum! The reformulation of Diorama smells more like a combination of Diorella and Parfum de Therese in the opening and goes back and forth between the two as you wear it. It isn't until the far drydown that you get a hint of the wonderful scent that vintage Diorama used to be, but this phase fades very quickly. The new Diorama is a little too heavy on the salty/citrusy notes an lacking in the peach/plum notes that made vintage Diorama a slightly sweeter version of the classic Miss Dior. In short, the new Diorama, while it's nice on it's own, just doesn't live up to the original. With all that said, when my $19 bottle of Chypre D'Orient arrived today, I was over moon when I spritzed it on and and immediately thought "vintage Diorama! "...yes, with oakmoss and all. For those of you who've never experienced vintage Diorama, if you want to and can't find it, get this as this is the closest that I've found to it. This week I've made another discovery: if you layer reformulated Diorama with Mitsouko you also get something very close to the original Diorama. It's all about the peach and plum and oakmoss notes and Chypre D'Orient has all three. Shame on Dior for allowing Molinard's Chypre D'Orient to steal it's vintage Diorama thunder! I'm giving reformulated Diorama a thumbs up for smelling like vintage Diorella and Parfum de Therese, both of which I love. There are no member images of Diorama yet. Why not be the first?